Facebook is to build its own “village” of 1,500 homes for workers struggling to pay soaring rents as the housing crisis in Silicon Valley deepens. The social networking company has submitted plans to the local council to create a new neighbourhood of homes, shops and a public plaza across the street from its global headquarters. Mark Zuckerberg’s company said it was being forced to build the “mixed-use village” called Willow Campus in Menlo Park, about 30 miles south of San Francisco, because the regional government’s “failure” to invest in infrastructure has led to sky-high rents and hours-long commutes to work. Kirsten Keith, the mayor of Menlo Park, welcomed Facebook’s plan to help address the rent-price-rise crisis caused by the rapid growth of west-coast technology companies. More than 640,000 new jobs have been created in the San Francisco Bay area since 2010 but house-building has failed to keep even close to that pace of growth. However, just 15% of the Facebook homes will be offered below market rates. The apartment block homes, which the company hopes will be built by 2021, will be available to Facebook employees and those working elsewhere. The average monthly rent in Menlo Park has more than tripled to $3,349 (£2,600) since 2011 when Facebook announced it would move to the city, according to property data site Rent Jungle. Menlo Park’s rents, which rise to an average of $3,934 for a two-bed apartment, are some of the highest in the country and considerably higher than in New York City. The median house price across Silicon Valley has jumped from $535,000 in 2012 to $888,000 last year, according to real estate agency Trulia. Zuckerberg, 33, who is the world’s fifth-richest person with a $64.7bn fortune, owns several homes worth tens of millions of dollars. He spent $30m buying up four houses surrounding his Palo Alto home in an effort to protect his privacy. He’s also spent $100m on a 700-acre plot on the Hawaiian island of Kauai and $10m on a home in San Francisco’s Dolores Heights. 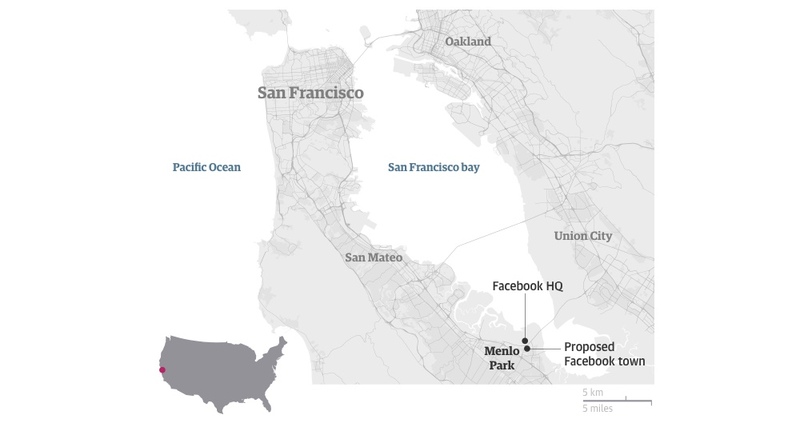 More than 9,000 people work at Facebook’s offices in Menlo Park, according to the city. The number of staff has increased by 54% over the past year and is expected to continue to rise quickly as a larger office campus opens. The huge influx of staff at Facebook and other large tech companies has forced thousands of key workers out of the area and many teachers, cleaners and support staff battle through miles of congested highways to work each morning. Tech workers are often bussed to offices in company-branded vehicles, angering local people who are concerned about growing inequality in the area. Facebook, which made profits of $12.4bn last year, has previously been criticised for exacerbating the housing crisis in Menlo Park by offering its staff a $10,000 bonus to move closer to its head office. John Liotti, chief executive of Able Works, a charity representing key workers, said at the time of previous iniative in 2015: “A lot of local families are going to get hurt.” Facebook said that scheme was “to support our employees and the people who matter most to them at all stages of life”. Facebook’s proposals for the Willow Park development, which will include a grocery store and pharmacy, have been welcomed by Diane Bailey, executive director of community group Menlo Spark. “We feel that Facebook genuinely wants to be a good neighbour,” she said. “They appear to have heard the requests of the community and they want to meet those requests. The area has not had a grocery store or pharmacy for a long time.” It can take more than half an hour to drive to the nearest supermarket four miles away due to traffic jams. The social network has also committed to spending $1m exploring the idea of reopening an old railway line that runs through the company’s campus and is “investing tens of millions” to improve a highway – US 101 – that runs from the office to San Francisco. There are no plans to build a new school. Facebook is not the only company seeking to tackle the housing crisis. Last month a spokesperson for Google said it would spend $30m on 300 prefabricated apartments for workers at its campus headquarters in nearby Mountain View. Apple, which is in the process of moving 12,000 staff into its new Apple Park headquarters in Cupertino, is paying a roughly $5m “housing mitigation fee” to the city in compensation for the burden it is placing on the city’s housing. The company estimates that its new office will lead to a 284% increase in demand for housing in the city.